With a bit of a surprise drop ahead of their slot at Laneway Festival this weekend, local glitter garage trio Jungle Cuffs have released the fiery ‘Indie Boys’ and we’re thrilled to be premiering it for them. Since forming in mid 2017, Jungle Cuffs have been steadily making a name for themselves around Melbourne with their no-nonsense garage-pop, cropping up on lineups all over the place and scoring some impressive supports with the likes of Angie McMahon, Rat!hammock and Fan Girl. It’s all the more impressive considering they’ve done it off the back of just one song, but now with the release of their second single it’s clear to see what the buzz is all about. 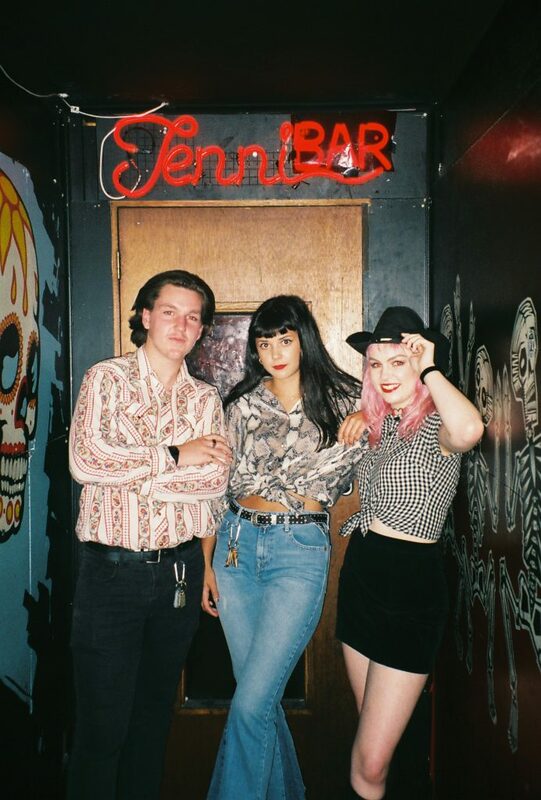 Inspired by “old razzes and failed indie boys that Evie has come across”, ‘Indie Boys’ is a burst of feverish garage rock that radiates energy and glorious sass. Build on a bed of crunchy guitar chords and backed by a propulsive rhythm section, the relatively straightforward instrumentation leaves plenty of room for vocalist Evie Vlah’s sardonic lyrics to leave a stark comment on “the tragically loved subculture that is indie boys”, spat out in a tidy, two minute blast. This weekend, Jungle Cuffs will be making the rest of the local scene proud by hitting the Girls Rock! stage at the Melbourne leg of Laneway Festival. What’s set to go down is anyone’s guess, as the band add “one of the last times we played ‘Indie Boys’ live was at a certain popular south side venue, where the crowd was full of very intoxicated, Ralph Lauren wearing dudes. One of them got so excited he jumped up and down, falling onto the stage as we were playing and spilling his beer everywhere. We were so angry we played louder and faster than ever, and we think it was the best we’ve ever played it!” If you’re heading to Laneway on Saturday, prepare for the unexpected, but it’s safe to say it’ll be a ripper of a show. Check out 'Indie Boys' above, and if you're heading to Laneway Festival tomorrow, catch Jungle Cuffs gracing the Girls Rock! stage.